We’re entering a new era of optimizing for search engines. And no, SEO is not dead. While many things stay the same in search, we can’t deny the new path we’re on with the introduction of machine-learning systems like Google’s RankBrain. The concept of RankBrain may seem technical and daunting, but it’s one that CMOs — not just technically savvy SEOs — must understand to be competitive in the months to come. How search results are changing. How to evolve your digital marketing strategy for machine learning search algorithms. And why you might need PPC advertising even more than ever. RankBrain is a machine-learning artificial intelligence system that came onto the scene in 2015. Bloomberg was the first among mainstream media to break the news of RankBrain, Google’s newest addition to search rankings. And while we officially met RankBrain in 2015, Google was talking about it as early as 2013. RankBrain is designed to better understand the meaning behind a searcher’s words. This 2013 post at Google discusses this concept of understanding word relationships if you want to learn more. From the Bloomberg article we learned that 15 percent of queries per day have never been seen by Google before. RankBrain helps interpret those novel queries. At the heart of RankBrain is a goal to better interpret search queries and serve the most relevant search results. This has been a lifelong goal of Google Search. We discuss this at greater length in our SEM Synergy podcast http://www.semsynergy.com/ (July 2016) here. Mobile drove the need for RankBrain even further. Mobile search behavior has been a game-changer, especially when it comes to voice search, something a lot of mobile users take advantage of. As you may know, queries tend to be much more conversational using voice search versus typing. RankBrain deals well with the long-tail queries that are common to voice search today, though there are plenty of long-tail searches typed into a search bar, too. I believe that RankBrain is preparing for a world where voice search will become more and more the norm. Remember, voice search is already on the rise. 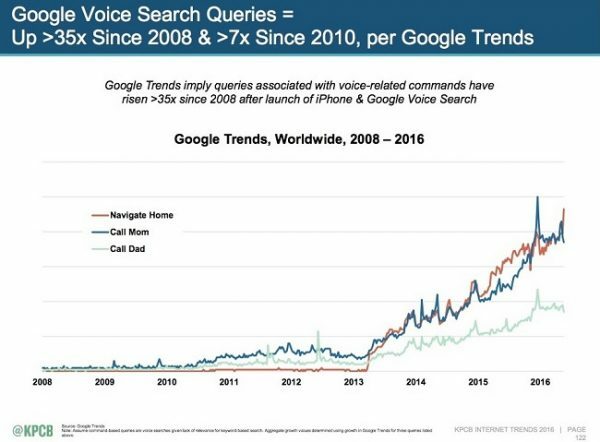 In a presentation by Mary Meeker on the popular 2016 internet trends report, we see that voice search is up 7x since 2010. And it’s not just voice search coming from mobile devices. Now, we have to consider things like voice assistants such as Google Home, where it remains to be seen how the device’s answers will pull from web results. RankBrain was designed to better analyze the language of websites in Google’s index, and then apply that analysis to a search query. By better understanding the search query, it can better match users with websites and pages. The purpose is to better understand the meaning of content and the intent behind a search query. Once RankBrain better understands the intent, it can then presumably apply the appropriate Google algorithm signals that deserve the most weight for that query. 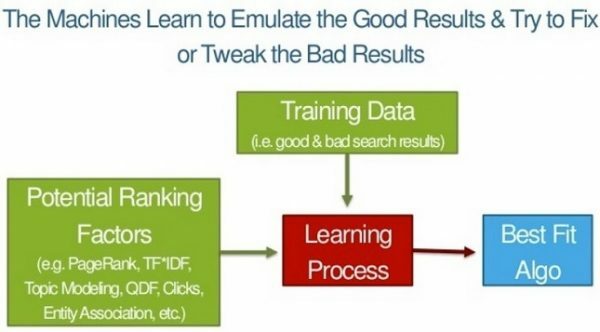 Essentially, RankBrain can take sets of “training” data created by humans to help establish a baseline, and then can apply machine learning to determine the best search results based on a variety of factors over time. Google confirmed in the Bloomberg article and in this article at Search Engine Land that they periodically update the system by giving it new data to better reason with new concepts. At SMX West 2016, some presenters shared examples of RankBrain in action. One study showed how RankBrain better interpreted the relationships between words. This could include the use of stop words in a search query (“the,” “without,” etc.) — words that were historically ignored by Google but are sometimes of critical importance to understanding the intent behind a query. Here’s another example query from an interview with Googler Gary Illyes: “Can you get 100% score on Super Mario without walk-through?” Ignoring “without” would potentially return search results on getting a 100 percent score on Super Mario with a walk-through … so the opposite of the results a person was trying to get. There are other theories on how RankBrain might use data to learn what the best results are for a search query. It’s possible that searchers’ engagement with the search results may be a factor in how RankBrain determines the relevancy of a result, as Rand Fishkin posits in a keynote from July 2016. For example, if someone clicks a search result and doesn’t go back to the search results to start clicking other web pages, this could indicate the searcher found what they were looking for. The machine could then learn over time that a low bounce rate signals a relevant result, so that web page could show up more often and higher in search results. As I mentioned earlier, RankBrain is essentially built into the query process to better understand language and make an improved match between the search query and the websites in the Google index. Remember that Google still has hundreds of other signals it can apply to a search query to identify the best results. In 2016, however, Google confirmed that RankBrain was among its top 3 ranking signals for search. Rounding out the top 3 are content and links. This is an important concept to understand. Google clearly stated that the signals that we’ve come to know to be important and that we’ve been optimizing for still matter: content and links. While the content on a website and its links are both essential to determining meaning and relevance, RankBrain works in partnership by assisting the Google search engine to better determine if a website is the most relevant based on signals and algorithms, given the searcher’s intent. With machine learning, RankBrain learns associations over time. That means, if a brand becomes associated with a certain product, the queries about that product may lead to more branded search results. Because Google tends to favor big brands online for a variety of reasons, with RankBrain things like the site’s engagement rate, mentions of the brand across many social sites and so on could further enhance favoritism here. This could happen despite the fact that some bigger brands may have a weaker link profile than other websites in their space. First, let’s talk content. For many, it’s actually business as usual. Examine your content to ensure it provides the best, most complete answers to a query, whether you’re an informational page or selling a product. RankBrain is a machine learning system, but it still needs input from your website. Yes, it’s working to better make connections about concepts. For example, we can give RankBrain credit for understanding a page is about baseball even if the word is never used and only “Chicago Cubs” and “New York Yankees” are present on a page. Absolutely one of the goals of SEO is to better help search engines understand what your content is about. It is still vital that you make sure you’re including the keywords that are important to your business on your website page. This includes keyword “stemming” (like “walked” and “walking” along with “walk” and “walks”) and using synonyms and natural word variations to help make connections between ideas. One example we use in our SEO training classes is the word “mercury.” You can use “mercury” 10 times on a page, but if you forget to use the word “planet,” then the search engine may be confused about the subject of the page. Is it an element, car, insurance or other? This is also a time to explore structured data markup, which helps search engines better make connections as to what is on the page. Remember, the little things matter as they always have in SEO. You’ll want to continue to pay attention to making your search results listings stand out in the crowd. That means ensuring each web page has custom meta data in addition to exploring other ways you can make it stand out using schema markup and useful, engaging copy. Another question to ask: Once people land on your website, is it helping them move farther along in their journey by offering up related content that explores a topic/product/service more? This can be accomplished by siloing your content to create subject themes around the key terms that are important to your business. I mentioned earlier that RankBrain will likely favor big brands. So what happens if you’re not a big brand? Now is the time to start thinking about how to supplement your digital marketing strategy, if you haven’t already. While it’s a great idea to have a thorough SEO strategy, it’s never a great idea to put all your eggs into one basket. So in the era of RankBrain, even though the basics of SEO that we know and love are still important, you’ll want to think of creative ways to grab that SERP real estate. That means if you’re not in the upper echelon of brands online in your space, consider supplementing your search marketing strategy with pay-per-click ads. If you’ve been concerned about how RankBrain impacts SEO, there’s possibly more to worry about than you may think. RankBrain is search results relevance on steroids. Simply put, you must improve your content relevancy to match the query intent. Yes, SEO best practices are critical to traffic, and rankings are more competitive than ever. But you must also focus on your content from a macro and micro level, and how your website’s content as a whole helps to answer the questions your audience is looking for. And don’t forget to supplement your digital marketing strategy with things like paid search, social and other channels to keep your brand top of mind. Do you have insights on the impact of RankBrain on search rankings? I want to know. Leave a comment below. We can help with your RankBrain optimized SEO strategy. Our services are tailor-made to match your goals and audience. For more revenue through digital marketing, let’s talk. Bruce Clay is founder and president of Bruce Clay, Inc., a global digital marketing firm providing search engine optimization, pay-per-click, social media marketing, SEO-friendly web architecture, and SEO tools and education. Connect with him on LinkedIn and other social networks from Bruce's author page. Using search engine optimization properly and with trained optimizing teams, SEO can be quite useful in today’s digital marketing world. It must be performed correctly though, utilizing proper keywords and analytics. An incredible itemized article clarifying rank cerebrum – Been searching for something that clarifies it top to bottom and essentially for some time! So you’re dabbling in alternate universes where you send us baked goods? Thanks for your insightful addition, Alan @Ascendant SEO! If we’re doing professional SEO, then we’re obviously in the game for evolution. If that means evolution beyond that standard SEO checklist and into a more meta-strategy, then we’ll have to be okay with that. Or maybe become a baker. Really great info on RankBrain here. Thanks for the insights, Bruce. With our SEO world constantly adapting, I found it particularly critical that you mentioned not putting all of your SEO eggs in one basket. In my humble opinion the diversification of tactics and strategies with an eye toward constant refinement & exploration into new technologies, like RankBrain, are critical to long term SEO effectiveness. That may not be the result of Rank Brain. Google have apparently eased-off some of the more aggressive hunting algo’s like Penguin/Panda; the result is more spam in the SERPs than we’ve seen for a while, and weaker/less relevant pages floating towards the top of the SERPs. And those “longer phrases” you are typing in, those are more likely to be processed by RB than shorter ones (shorter tends to be more common – RB deals with the rarer queries). RankBrain to me is a big failure. I have a much harder time trying to find results that I look for making me use longer phases to find what I want and still come up short. As result I go elsewhere to find. Personally, I find the reaction to RankBrain a little worrying. Machine Learning and Artificial Intelligence (ML & AI) are far from new to Google, and have been used in various cases/degrees for many (many) years. How do people think G was deciding on thresholds, or discovering new forms of spam, or identifying more involved link networks? Yes, there was a core set of data hand crafted and initially identified by humans – but the next generation of data was produced by algorithms, annotated and then fed back in. Over time you end up with a system that generally develops it’s own perceptions and models (from supervised to semi-supervised to un-supervised/automated). RankBrain is the cumulation of a decade+ of data analysis, research and automation, all refined and bundled together. The primary purpose of RB is to fill the gap that stricter methods fail upon; the biggest gap being “unknown terms”. Google have reported that they see a large % of “new queries” on a daily basis. Using general linguistic approaches – they are able to associate search string patterns and identify the general type of search. Further, they can identify the likely search type based upon the phrasing of the query. This helps them not only identify potential synonyms, but whittle the result set down to more likely results based upon the type of content (why show blog-posts when it’s a purchase query, why show product listings when it’s a comparative query etc.). As for the whole “voice search” – nothing new there. That trend started years ago when the last two generations of net-searchers (who never grew up using search parameters, and the idea of using +, -, ” or  in searches seems silly). Instead, these people typed in an almost normal fashion, using search-phrases. Voice search is the natural child of long-tail searches, and G have been getting ready for it for as long as I can remember! Technically, the only thing people have to do to prepare themselves for voice search is ensure that they include relevant terms and quantifiers/disqualifiers. That means people need to understand (once and for all) how stupid it is to ignore “stop words”, and make sure they write in a natural (none-keyword focused) way. * Cover the target words/phrases. Do that, and you end up with content that is clear, covers the right words, contains the right phrases to corresponding searches, and avoids being seen as potentially relevant to other unrelated searches. Bounce Rate – how I hate this one coming up, anywhere! As far as I am aware, G do NOT use BR as a ranking signal, and never have. BR is a Google Analytics measurement, and G do Not have enough sites using that tool to apply properly. GA metrics are not used to directly influence any sites rankings. (NOTE: That does Not mean G are not analysing the data and identifying patterns of on-site user behaviour – but that is something different). What would be more accurate is Bounce Back to SERPS or Return to SERPs Bounces – which is a User based metric that G can see across all pages in it’s index (despite many not using Search Console, Google Analytics, G+ share code etc. etc. etc.). It is still noisy, but far more likely (and there are patents for such – some many years old!). I do wish people would stop being so shallow with their analysis. There are multiple potentials when looking at things, including BBtSERPs. 1) Yes, sure, G could see that a high % of searchers seem to “stick” to a page (they click and don’t return to the SERP). 3) G could instead note pages that perform poorly and push them down the SERPs (and considering how hard it is to identify “quality”, far more probable!). But none of this is new! The patents are years old (variants for tracking Title performance, Positional CTR performance, Descriptions and Search types etc. etc. etc.). G have been doing this stuff long before RankBrain was even a concept. There’s also every chance that there are separate layers and multiple monitors – just because you see something does not mean it is part of RB. G are more than happy to run multiple filters, and even split out well performing algo’s to run on their own (as they did with Top Heavy and some features of Panda!). RankBrain is totally depended on User Engagement. Bounce rate is a primary factor of user engagement. Search engine optimization is not dead but black hat SEO is dead after full implementation of Rankbrain. I’d love to know how a system designed to more accurately ascertain searcher intent and find associated terms/relevant content is going to beat black-hat spam methods. As far as I’m aware, RB has nothing to do with link-analysis, and doesn’t run over the content to identify potential spam (though, technically, if the system is built to classify searcher-intent and corresponding content, it could be adapted for such). So how exactly does a “semantic system” aid G in fighting questionable links, of hacked sites etc.??? RankBrain effect the sites SEO ranking as well as hugh drop in traffic. My website also eefected from rank brain i dont know what to do with this issues to back on the track? You have rightly mentioned that mobile drove the need for RankBrain much further. Well written blog indeed. Many people are still not clear about RankBrain while it is among the top ranking factors for Google today. Thanks for sharing this post. I’ve been using this algorithm for some time now. I have to admit that it is working much better than I expected. Such a useful article on Rank brain algorithm. I think still I can get my ranking back, which I lost because of this algorithm. Anyways, thanks for the information. A great detailed article explaining rank brain – Been looking for something that explains it in depth and simply for a while! SEO is now extremely important for businesses. The search algorithm always changes, and the Seoer also have to adapt accordingly. Thanks for this tips as I was looking for a solid information about rankbrain and how rankbrain will affect rankings. Another question does this mean link will become less important when it comes to rankings ? An insightful article about Rankbrain. I think SEO will always have a place when it comes to marketing websites in order o ensure that Google and other search engines truly understand what the topic of the site is. Hi Intraday. Thanks for your question. Bruce mentioned bounce rate as one of the signals that a machine could observe to see how engaged a user is with content they clicked on from a search result. “The machine could then learn over time that a low bounce rate signals a relevant result,” — in other words, low bounce rate means more visitors staying on a page, meaning a page is satisfying the query. That leads to “so that web page could show up more often and higher in search results,” — in other words, low bounce rate leads to higher rankings. RankBrain is performing better than Adwords. But I’d suggest to use it only if you have high DA blog. The extra effort that is required to stay ahead requires higher fees to compensate for the extra time spent. Adwords keep going up in price, so should the cost of organic SEO. i almost lost more than 3000 visitor from organic traffic. A well thought out article Bruce. I think Googles push to get websites to reduce better quality content that answers their users queries is only going to become prevalent as time goes on. The Fred update shows they are actively going after thin, ad heavy websites. Very informative piece Bruce. The issue about Rankbrain and SEO has always been present since Rankbrain was launched but I do have to agree with you. SEO is not dead. From last 6 month, I am struggling to get traffic on new website. I think rank brain is killing small budget websites and ranking brands websites with good DA. From last few days, I was worried what strategy we should follow to get better results in terms of the traffic and organic ranking in SERP and after the reading this post I am excited to apply above strategies for my website to achieve the desired results. Thank You, Bruce Sir sharing this post in such a descriptive manner. Mostly Sites loss their traffic and this update affected only on those sites who are doing natural work all black hat sites are going on top.